My first selection was on an overhang, not the biggest one, but at least it wasn’t on a straight wall. It was a lovely route and I enjoyed climbing it. This time, I kept to my route. I was able to concentrate and stay calm during my climb. I was the only one of my category to top the first selection. Because of this, I could climb more relaxed in my second route. Even though I knew I still had to climb good, I was really glad that the first route went so well. In the last moves of my first selection I had to be extra attentive. My legs were shaking and I didn’t want to let go when I had already come this far. I was happy when I came down. Between the selections, I had fun with Laure-Anne and Elfe. I helped read Cathinka, Laure-Anne and Elfe’s second selection, which was my first selection. And my second was the A boys’ first selection. So I read with Sam and Anak. And then just before the demonstration, Loïc, Héllo, Anak and me, we all read together. I had to climb first right after the demo. I was getting stressed out because I was worried that I wouldn’t be ready in time tying my shoes. Then, unfortunately, I had to wait more than 5 minutes before I could start. I climbed relaxed and stuck to my route. It was only my route that mattered. I never have this kind of moment that when you start you have the feeling that you are completely alone while being surrounded by people. I am always very well aware that there is a big audience behind me. But what I did was just to ignore them, to act like they were not there. Like in school, when you don’t want someone to be there, you ignore them. It was only in the last 4 moves that I became stressed. This was also the moment when my ignoring ability ran out. I began shaking. I said to myself to relax but it helped only a little bit. I hurried up to the last hold and grabbed it tightly not releasing it until I clipped. So I topped which meant that I was ranked first in the finals. Now, I really didn’t want to lose anymore. We had a long pause and we ate, but most of all we supported the others in there routes. 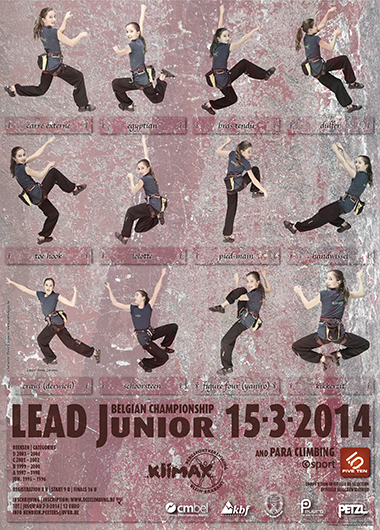 Our Klimax climbers gathered some good places in the finals. Up to now, nothing went wrong, but how is it possible that Celine Cuypers climbs a competition where nothing goes wrong. Yeah I am hopeless on that point. This time, I had not forgotten my shoes, neither my harness, nor my chalk bag in isolation. I was completely equipped and prepared myself to climb. I motivated others just before they had to climb and then I tried to motivate myself which did not work out very well. I wished Elfe good luck. I had to wait on the stairs for a while and then it was my turn. Breathing in and out, everything was in control. The beginning was technical and every minute on that wall, I was scared to fall. Gripping the holds tighter than necessary, I went on, speeding up, but not too fast and still in control, over to the light overhang. I got there smoothly and then came the part in the big overhang. I reached out to a big hold, but I cannot say that it was a good one. So, I went on to the next hold and wanted to clip in the quick-draw but here comes my fault. It is not possible for me to do a competition without doing something stupid. I felt my hand slipping. I knew I was falling and I quickly took hold of the quick-draw. There you have my tears spilled down. I was not pleased. Who is so stupid to grab a quick-draw? And this is not the only stupid thing I have ever done in a competition. If you want, I can tell you all about them, but then I would be busy writing this article for days. And that is not so funny because doing so I will only feel worse about myself. I came out first because I had one hold more than the other two. I won over Héllo with a plus and she again had a plus over Margot.